A cotton filled pillow seems like it’d be pretty comfortable right? I’ve been manufacturing and selling pillows for many years. In an effort to make the best products possible, I’m consistently buying and testing different types. I thought I’d tried almost everything, but recently someone asked me about cotton-filled pillows, “are they comfortable?” I honestly didn’t know. I’d never come across a cotton pillow, which seemed odd, given that cotton is one of most popular materials in the world. 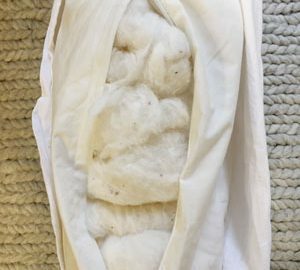 I don’t live under a rock, so I was already familiar with the texture of unspun cotton: it’s soft and compressible similar to other traditional pillow filling like down. It seemed safe to assume that a cotton-filled pillow would be reasonably comfortable. I committed to finding a nice one online. Surprisingly, cotton pillows aren’t easy to find. Note: I’m not a fan of these modern petroleum-based pillow fillings. Most are not biodegradable and some are potentially hazardous to your health. Thus, cotton-filled pillows seem like a good healthy and eco-friendly alternative that was worth trying. After comparing the few products available, I finally decided on what seemed to be the best available standard size (20×26”) organic cotton pillow. After a couple days, the pillow arrived at my door and my helpful children tore into the box for me. They’ve both slept on hefty buckwheat pillows their entire life, so this light and fluffy thing was immediately impressive to them. I was a little more skeptical. How does it feel? Soft/Firm/Malleable? First, I was surprised that the pillow wasn’t more squishy. While “soft,” is an accurate adjective to describe cotton, relative to some other popular pillow fillings, it felt rather firm. Down and polyfill offer far greater compressibility. Mind you, a firm pillow can be preferable for many, if it is also malleable. A malleable filling will conform to the shape of your shoulders, neck and head. Even support of your head’s weight will eliminate uncomfortable pressure points (and help you sleep). Unfortunately the cotton filling in my pillow didn’t seem very malleable. It had a relatively constant form when packed into a pillowcase. Its rectangular loaf-like shape wasn’t easily changed. The pillow I purchased is adjustable, thanks to its zippered opening. The fabric case included a zippered opening along one end, allowing me to easily add or remove the cotton filling. This way I could adjust the loft (thickness) of the pillow to accurately position my head off the mattress. As a side sleeper, I tend to prefer a medium to high loft pillow. This pillow’s loft seemed just about right for me out of the box, so I didn’t need to remove any of the cotton filling. Those that prefer a thicker pillow would need to purchase additional cotton filling (or find another pillow) to give it more loft. The fabric case was durable and the cotton packed inside seemed to be of high quality. I opened it and found that the cotton filling was a uniform and consistent density. It didn’t concern me, but it was interesting to see a few foreign materials that were left behind in the milling process within the cotton. It didn’t look like the bleached white cotton balls I expected. thoroughly dry it; it’s very easy for mildew to grow inside as cotton will hold a lot of moisture. A new pillow obviously shouldn’t smell bad. Unfortunately many of the most popular pillows available do. Modern pillow filling like memory foam can emit a powerful glue-like smell due to a manufacturing process involving petrochemicals. The first time I tried a memory foam pillow I was shocked at its overwhelming odor. Manufacturers call this “off-gassing.” Fortunately my cotton pillow had no discernible odor. My cotton pillow after 1 month of sleeping and 4 months of pillow forts. I slipped my new cotton pillow into a pillow case and gave it a test run. I’ve got several types of pillows laying around the house to use as A/B test subjects, so it was easy to compare it to the competition. 1. Cotton pillows are not as supportive as some other pillow types. As I mentioned above, my impression when it came out of the box was that it didn’t seem very malleable. My suspicion was correct. I tried to adjust the cotton filling; pushing it toward the edges in an effort to make an indentation for my head. The cotton filling is mashed, tangled and twisted into one large rectangular piece that stubbornly holds its shape. It isn’t capable of offering the same uniform support that a moldable pillow filling like down or buckwheat hulls can provide. With soft pillow filling like down, “fluffing” it opens space between the feather filling, making it thicker (and softer). Having fluffed a down pillow, you can sink your head into it, pushing the feather fill to the edges, which wrap around your head providing excellent support. I tried this technique with my cotton pillow. Again, the cotton filling proved resilient to adjustments. The lack of support had me constantly readjusting both my pillow and sleeping position. 2. Cotton pillows are cooler than most pillow types (but not all). I’ve written extensively about different pillows’ ability to stay cool. It’s pretty simple really: breathable pillows are cool pillows. Pillow filling types that allow air to circulate freely will permit warm humid air to quickly escape, keeping your pillow comfortable all night long. Conversely, pillow fill types that restrict airflow tend to build up and retain body heat. All pillows absorb your body heat. Some types of pillow filling like memory foam can retain that heat for over a half an hour. Other breathable pillow filling like buckwheat hulls allow the warm air to escape quickly in just 5 minutes. It turns out that cotton-filled pillows are more breathable than the most popular pillow types including memory foam, down and polyfill. I did simple tests with a laser surface thermometer. At room temperature, my cotton pillow’s surface temperature was 76 degrees. Next, I rested my head on the pillow for 15 minutes and took another surface temperature reading: 91.5 degrees. The cotton pillow reverted to room temperature in 22 minutes. It shed its warmth twice as quickly as my memory foam pillow. Not bad. On the other hand, the cotton filling couldn’t compete with the breathable filling of a buckwheat pillow which returned to room temperature in only 2 minutes! 3. Cotton pillow filling has a significant disadvantage: it clumps and flattens with use. Initially I had no complaints about clumping or flattening. My cotton pillow seemed like it was uniform in shape and compressibility and elasticity. It also seemed to have enough loft to support my side sleeping position relatively consistently. I kept sleeping on it for 3-4 weeks, despite being generally unhappy with it, because it can take awhile to get used to a new bed pillow. After finally giving up, it made its way into my kids’ pillow fort construction. The pillow has been kicking around our house for almost 5 months. It is clumping (see photo), making it feel lumpy and less malleable than it was when new. The pillow is also thinner; it used to have sufficient loft to keep my head elevated properly, but now it’s too thin. I’m acclimated to buckwheat pillows, which offer support that’s superior to any other pillow filling I’ve tried, so the cotton filling was a bit of a disappointment. To those who are accustomed to soft, squishy pillow filling like down, a cotton pillow might be more impressive. are allergic to down. Although quite rare, these allergies do exist. live a vegan lifestyle. Duck feather plucking is not required on the cotton farm! have a concern for the environment. Cotton pillows are biodegradable. Thus, they are a much more ecologically sound alternative to petroleum-based products like polyfill and memory foam (note that the production of traditional cotton can result in some unacceptable pollution as well. Thus, certified organic cotton grown and produced under strict standards are preferred). For me, the lack of malleability was the cotton pillow’s biggest flaw. No matter what I tried, I couldn’t make it stay in the shape I wanted and as a result I wasn’t getting the best sleep. It made me wonder if a pillow filled with thousands of cotton balls would be more comfortable… would it be more malleable? I have been surprised to find that the shredded varieties (material torn into tiny pieces) of latex, memory and poly foam filling are considerably more comfortable than the solid single piece alternatives. Maybe I should head down to the drug store and buy some cotton balls for my next pillow experiment! 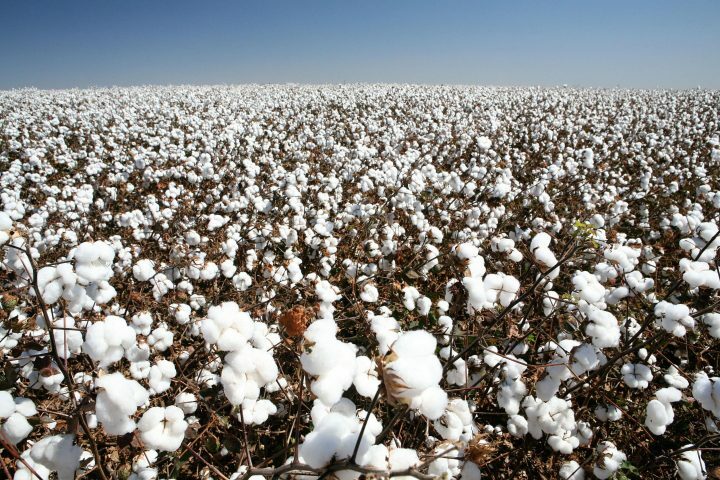 If you’re looking specifically for a “soft” alternative to down or petrochemical fill, cotton (or kapok) could be a good option for you. It’s safe, doesn’t have any chemical odor, and is eco-conscious. … like our own Hullo™ buckwheat pillow! Give one a try and I think you’ll agree that it’s superior to other pillow types. Don’t take my word for it — check out these customer reviews. Have you ever tried a buckwheat pillow? Give Hullo a try for 60 nights. If you're not sleeping better, return it to us for a full refund.